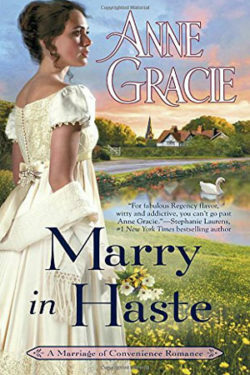 Anne Gracie is a new-to-me author, and I can’t wait to read more of her books. I don’t know how I missed them along the way, but I have added a few to my always growing TBR pile! MARRY IN HASTE is the first book in the MARRIAGE OF CONVENIENCE SERIES and I can’t wait for more. Set in the early 1800’s in England there is a lot of action and adventures but also well developed characters that had a depth to them. The characters were at times at each other’s throats, angry, or filled with fun and love. Cal is thrown into a situation he didn’t expect–becoming Lord Ashendon and the head of his family after the unexpected demise of his brother, the previous earl. Watching him come to grips with what should be his new life, and as guardian to his half-sisters and a niece he didn’t know he had, was both heartbreaking and heartwarming. Miss Westwood catches his eye, and he can’t believe how well his sisters behave for her. Enter thoughts of how he can hire her to guide them through their season in London, and the pace picks up. The story is filled with family and friends, secrets, rumors, and so much more. There are twists and turns to the story–some expected and others not. There is a happily-ever-after and nice closure, especially with the epilogue. I for one can’t wait for more!